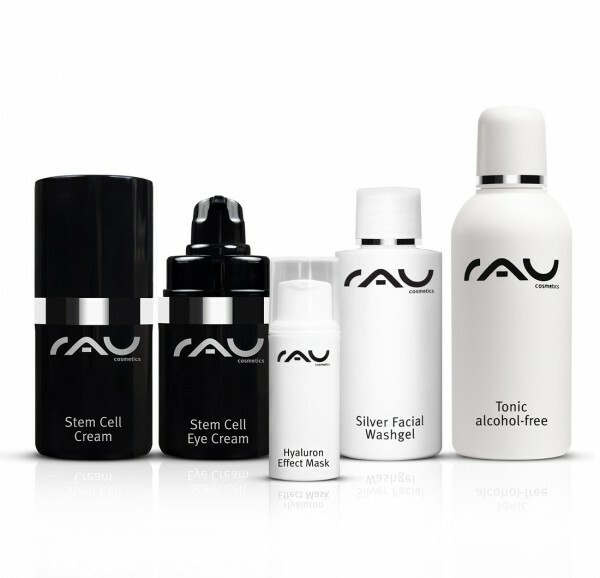 "RAU Silver Facial Washgel": Shake well before use to equally disperse its micro-fine silver particles. Slightly moisten your face and pump one portion of "RAU Silver Facial Washgel" on your palms. Foam it up and then massage it into your face for about one minute. Afterwards, rinse it off thoroughly and dry your face. Now, apply some "RAU Tonic alcohol-free" on a cotton pad, cleanse your face and let it stay on for a moment until it has been absorbed by your skin. Afterwards, apply one portion of "RAU Stem Cell Eye Cream" on your eye area. Gently tap it in until your fingertips seem to be sticking on your skin. At this point, its valuable active ingredients have penetrated your skin and can nourish it from inside. Then, apply sufficient amount of "RAU Stem Cell Concentrate" to all skin areas especially affected by aging (e. g. the corners of the mouth, around the lips. between the eyes, on the forehead). Tap it in gently until your fingers seem to be sticking on your skin. Finally, spread 1-2 portions "RAU Stem Cell Cream" on your face and gently massage it in. Alternatively, you can use "Extrait de Caviar Rich Cream" as rich night cream instead of "RAU Stem Cell Cream". Related links to "RAU Cosmetics Starter Set Mature Skin - SMALL"
Customer evaluation for "RAU Cosmetics Starter Set Mature Skin - SMALL"